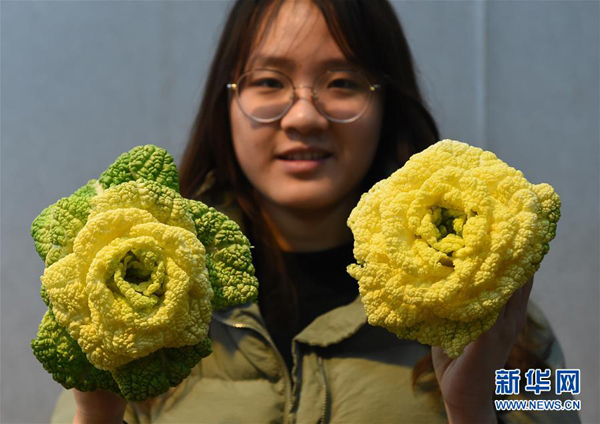 The "yellow roses" cultivated by Professor Hou Xilin and his team at the College of Horticulture at Nanjing Agricultural University are nicely-shaped, tasty and full of vitamin C.
Unlike the common type you may pick from a rose bush or order at a florist's, Professor Hou's "yellow roses" are actually Chinese cabbages, a nutritious, traditional vegetable which grows in the earth and has curly light yellow and green leaves. Moreover, the "flower" features eye-catching frost resistance. As the weather gets chillier, its leaves will become more yellow and be able to contain as much of 156 milligrams of vitamin C per 100 grams. As such, the coolest days of February mark the most beautiful and nourishing season for the vegetable, while also making it a top choice for Valentine's Day gifts.